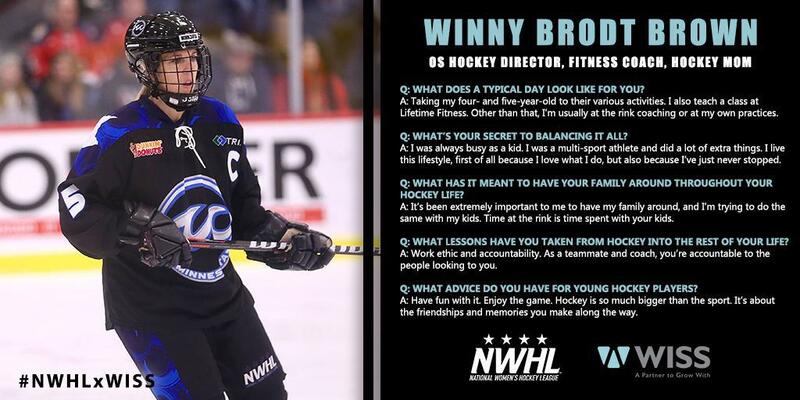 #NWHLxWISS is a series in partnership with accounting firm WISS that highlights the careers, interests and stories of women in the NWHL as well as women working at WISS. If you know anything about hockey in the state of Minnesota, you’ve heard of the Brodts. Jack Brodt, Winny Brodt Brown’s father, co-founded the Minnesota Whitecaps in 2004. Winny and her sister, Chelsey were original members of the team. Before the founding of the Whitecaps, Winny played collegiately at University of Minnesota, winning a pair of NCAA championships, and spent 10 years with the U.S. National Team. She founded OS Hockey in 2008, a program dedicated to providing elite-level training and coaching for girls. And on top of all of that, Winny is now passing the family love for the game down to her own children. So you’re definitely very busy. What does a typical day look like for you -- if there is such thing as a typical day? Every day is day-to-day. I have a four- and a five-year-old, so my days are usually taking them to all the things they do -- swimming and gymnastics and golf and hockey. It’s a lot of taking them to their activities and to school. I also teach at Lifetime Fitness. The class is called total conditioning. Other than that, I’m usually at the rink working with Association kids, coaching, or at my own practices now! What’s your secret to balancing it all? I think it’s just because I was always so busy as a kid. I was a multi-sport athlete, and my parents always signed me up for extra things like Brownies and gymnastics and soccer. So I’ve always lived in that lifestyle. I like to stay this busy because I love what I do first of all, but also just because I haven’t stopped. It’s one of those things where once you slow down it’s hard to stop. I tell people the same thing when they ask me how I’m still playing hockey at 40. I’ve just never stopped. Hockey has always been a family event for you. What has it meant for you to have your family around throughout your life playing hockey? It’s been extremely important for me to have my family around, so I’ve been trying to do the same with my kids. Time at the rink is time spent with your kids, and it shows your kids that you care. And then they’re interested in the things you do too. So, it’s always been really special to me to have my family involved. What lessons have you learned from hockey that you’ve been able to translate in your life outside hockey? The things it’s taught me most are work ethic, hard work and dedication, and accountability. Being a teammate and a coach, you’re held accountable. You’re accountable to your teammates or to the people who are looking to you. That’s really carried over, and doing what I do with girls in hockey, it shows kids that it’s important to build healthy relationships and live a healthy life. What advice do you have for young hockey players? Enjoy the game. Have fun with it. Hockey is so much bigger than the sport. It’s about the friendships and the memories that you make along the way.